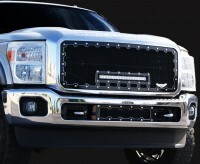 217-056-2-ML: 11-16 Ford F-250/F-350/F-350 BRUTE™ Custom Machined Special Edition Grille with or without 18" LED Light Bar. This true custom grille is a step above all the rest in quality and looks. The frame is made from solid CNC machined billet aluminum. It is powder coated gloss black and intricately trimed with satin silver trim. The complete frame is then re-coated with a proprietry clear powder coat for added depth of finish and added protection. Polished solid stainless steel studs are installed for an aggresive and custom look. The heavy gauge mesh is 100% stainless steel and also powder coated gloss black so in the event of a road chip, it won't start rusting like the other guys do. An 18" super bright high quality LED light comes pre-installed in the grille (if selected). Grille is assembled and installed with supplied stainless steel hardware - no rust starting here! Modification to OE factory grille is required. Comes complete with comprehensive installation instructions. LED option comes with wiring harnes and interior switch for LED light. Manufacturers logo is removable. Backed by manufacturers lifetime warranty. Quality made in the USA. Matching bumper grille is also available above as optional item. Please select with or without LED option above. Tell your friends about the BRUTE Custom Machined Grille (Black & Silver). Share this product on Facebook, Twitter, MySpace or send an email to a friend!